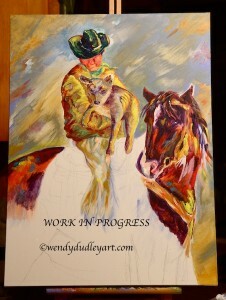 Many of you have expressed the fact you enjoy seeing my paintings in progress. I don’t work up all my pieces in the same way; it depends on the subject and colours and style I wish to achieve, but generally I block out the design and the shadowed areas. 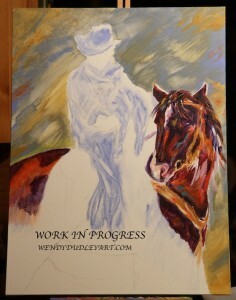 I don’t like over-planning, as much of the fun comes from seeing how the paint goes down and where my mood will take it. Just like writing, the painting begins to take on its own life, and it is always a thrill to see where it goes. This entry was posted in About the Work on May 22, 2015 by Wendy. Where we sit in the circle can change our view. Whether a cloudy day or white with bright light, I seek a positive view. Some times clouds do get in the way, but by changing where I sit, I can send them scurrying. I wonder if cows think the same way. 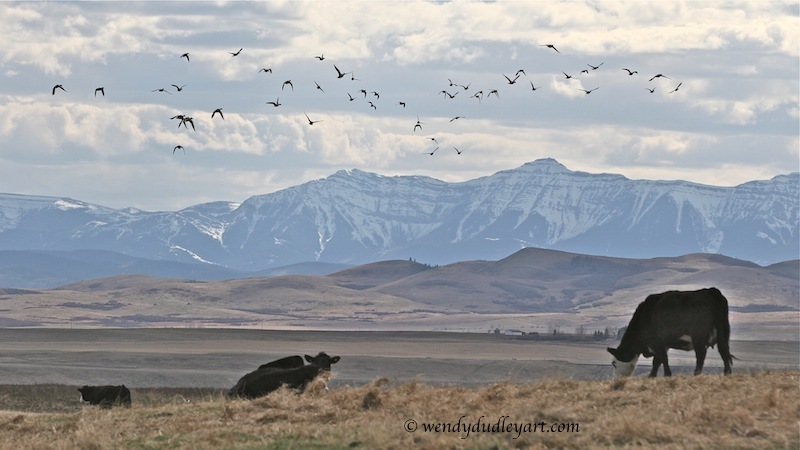 This entry was posted in Musings on May 22, 2015 by Wendy. I am often asked how I come up with my painting themes. Often I will dream of certain colours bursting like fireworks, and that will be worked into one of my subjects. Other times, I may have a dream or vision and want to get it down, like I did with my Walking With the Dalai Lama image. I woke up, seeing the Dalai Lama accompanied by two bears, one on each side. It was remarkable and I just had to paint it. 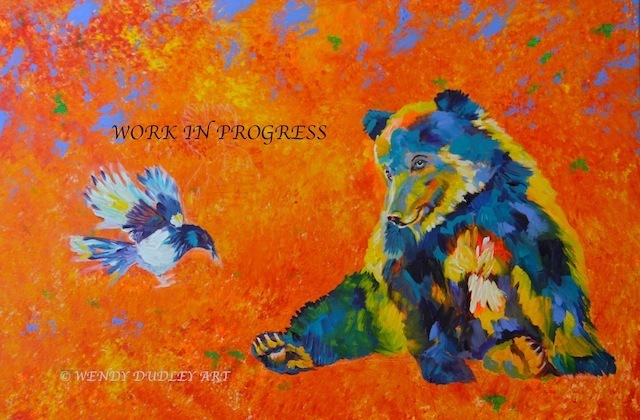 With my painting, Cheeky, it was based on a bear that came to visit in the summer of 2014. I was sitting by my garden, reading. I became aware of a black and white blur and looked up, expecting to see one of my dogs. But there, also sitting near me, was a sow bear, bending down the long grasses. It was a moment we shared, both of us enjoying the quiet day. The image of her sitting there, so content, stayed with me. She had a big white splash on her chest. A year later, I am finally painting her in the same pose. This entry was posted in About the Work on May 14, 2015 by Wendy. 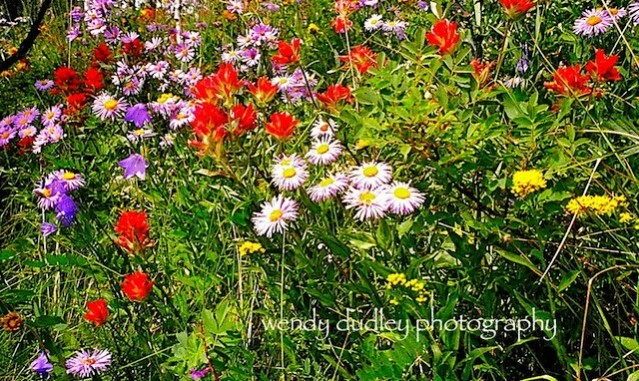 Welcome to Wendy Dudley Art. While this website is dedicated primarily to my acrylic paintings, I am a writer by trade and enjoy sharing my thoughts and inspirations. 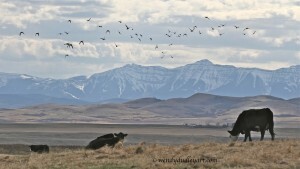 My work rises from my surroundings, a chunk of paradise in the Alberta foothills, southwest of Calgary. I will take you on a journey down its trails and over its hills, as it is the land and animals that give me strength and ideas. I am connected to the whims of the weather, the migration of birds, and the wanderings of the elk, deer, wolves and cougars. Mornings are a cacophony of bird song, evenings a sonnet of owls and coyote choruses. You will meet my donkeys, mule and dogs and various other creatures. We are all animals, and we breathe the same air and witness the same moon and sun that gives us life. 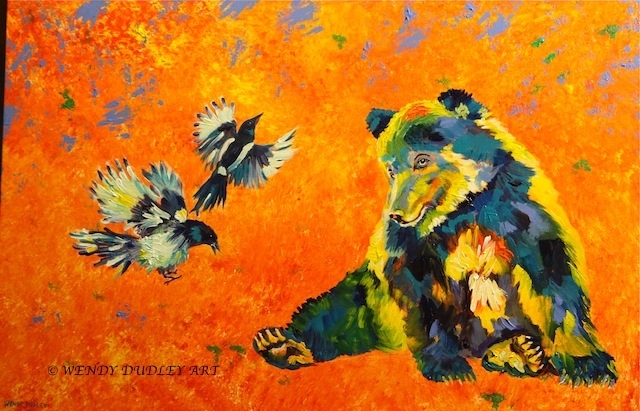 My response to the natural world travels through my paintbrush and onto the canvas through vibrant colour and energy, always telling a story, and leaving much to the viewer’s imagination. After a lifetime working as a journalist and then freelance writer and photographer, I was driven to once again pick up my brushes. As a kid, I loved to paint, inspired by the wilds of the Canadian Shield; its lakes, rock outcrops and forests. And now, at the other end of my life, I have returned to playing with primary and secondary colours. Such fun! There is nothing like watching others react to an image. Each person sees something different. I want my art to be uplifting, to be a reprieve from chaos. I hope it brings you both strength and joy. 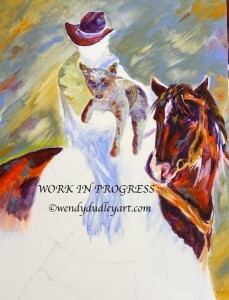 Along the way, as we navigate hills, valleys and switchbacks, I will share with you my process. Enjoy!